Size: XL, Extra Large. Chest: 24” (underarm seam to underarm seam). Shoulder: 24” (top seam to top seam). Sleeves: 9” (shoulder seem to sleeve end). Material: 100% Cotton. 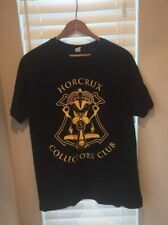 Harry Potter Horcrux Collectors Club T-Shirt Large. Condition is Pre-owned. Shipped with USPS First Class Package. This nice looking shirt is made of 100% cotton, and will wear well for several more years. The armpit measures 20 inches from Pitt to pit or 40 inches total around. The front measures 23 inches from the top of the neck to the bottom front. The artist of the shirt is Matt Dearden snd was inspired by Harry Potter and sold in 2012. Black crewneck cotton short sleeve. IT CROWD tee shirt. a perfect fit. 100% pre-shrunk cotton Chest: 42" --- Length: 31". Item Notes: Very nice looking Doctor Who Tardis Graphic with many iconic villians around the machine. Plain on back of tee. Shirt still looks excellent and looks like new. Color: Black / Blue. We will do everything in our power to resolve issues amicably. Chest: 44" -- Length: 30". Sleeves: 7 1/2” (shoulder seem to sleeve end). Material: 100% Cotton. 100% pre-shrunk cotton Chest: 50" -- Length: 31.5". 100% pre-shrunk cotton Chest: 42" -- Length: 30". Chest: 44" -- Length: 31". 100% pre-shrunk cotton Chest: 44" -- Length: 30"
This is a light tan t-shirt representing the JOSS WHEDON series, DR. HORRIBLE'S SING ALONG. It features a crest on the front, depicting various Pokemons, with the banner reading, "GOTTA CATCH EM ALL.". This is a green t-shirt representing the POKEMON franchise. The shirt is in good condition with no visible flaws but for a VERY slight discoloration, shown in the last two pictures. Star Wars Rey Tee Fury Glowing Lightsaber Black Shirt. 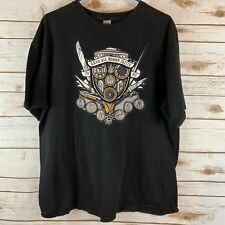 THIS SHIRT IS PREOWNED AND HAS BEEN WORN I've got nothing to hide. Not your size or style?. COLOR: BLACK. No trades will be accepted, cash only. 100% pre-shrunk cotton Chest: 44" -- Length: 30". See pictures. Check with your country prior to purchasing. I will answer as soon as I can. Shoulder to hem - 29". Chest - 24". Short sleeve. Blue with graphics on the front. Size XLarge. In good preowned condition. This is a black t-shirt representing the LEGO guy from the LEGO MOVIE - inside and out. It is by TEEFURY. ASH VS THE EVEL DEAD. US FROM THE TERROR. GRAPHIC ON FRONT. 100 % COTTON. SLEEVE 10". HAIL TO THE KING. Reads, Spartan Academy. Est 480 BC. Color : Red. Size : Large. Back Neckline to Waistline - 31". Chest: 44" -- Length: 30". 100% pre-shrunk cotton.